Arguably the funkiest car in its class – but is the Kia Soul one of the best. It’s a testament to just how far Kia has come in design terms that it’s managed to sell a car with the Soul’s looks without it feeling out of place. A little over ten years ago, the thought of Kia selling a funky compact crossover was just a pipe dream; now, the Soul has not only bucked that trend, but firmly established itself as the wannabe style icon of the Kia range. Good looks don’t guarantee a good car, however – anyone who remembers the earliest of the modern MINI models that came to the States will know very well that style can very much be achieved at the expense of substance. So, is there more to the Kia Soul than its design? The Kia Soul is a remarkably practical car for its size. One particularly sound benefit of those boxy proportions is that the Kia Soul is a remarkably practical car for its size. Even six-footers should feel have enough space in the front and back seats, thanks to the generous amounts of head and leg room, and the plentiful array of sizeable storage spots (with our favourite being the well-sized glove box) means there are plenty of cubbies in the Kia Soul. We’re also rather satisfied with the Kia Soul’s trunk space. At a whisker under 19 cubic feet with the rear seat backs up and almost 50 cubic feet with them folded down, the Soul is not only on par with some of the most spacious cars in this class (namely the Jeep Renegade and Fiat 500X), but is also cavernous enough to swallow up all of the gear you’ll be carrying about on a weekly basis. Giant grocery trip hauls and flat pack furniture sets should fit in the back of the Kia Soul with relative ease – especially when the opening itself is very wide, and there’s hardly a load lip to contend with. Thankfully, Kia’s done a rather impressive job when it comes to making a car with a $16,000 sticker price feel like an upmarket product. Having all this lovely space won’t mean a huge amount if the cabin isn’t a pleasant space to spend time in. Thankfully, Kia’s done a rather impressive job when it comes to making a car with a $16,000 sticker price feel like an upmarket product. Lots of high quality materials are used, with a good amount of soft-touch and tactile trim pieces dotted about the dashboard and the main contact areas, and the overall design has a far more premium feel than the slightly iffy in places setup that you’ll find on a handful of rivals, such as the soon-to-be-facelifted Buick Encore. We’ll let you decide on whether the overwhelmingly circular theme to the interior design is pulled off well, but there’s no denying that it hasn’t negatively impacted the ergonomics of the interior. All of the controls are intuitively laid out, with the large dials on the center console being especially simple and easy to operate on the move. It’s a shame, then, that the slick touchscreen interface that further improves the car’s usability isn’t available on entry-level models. The ride quality, for instance, is very well judged indeed. 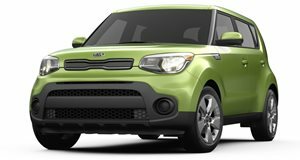 Surprisingly, for a car that’s very much marketed to the more youthful end of the market, the Kia Soul isn’t a car you’d place on the sportier side of the compact crossover spectrum. Instead, Kia has refreshingly taken a more comfort-orientated approach with the car – thus making the Soul a remarkably pleasant vehicle to live with on a day-to-day basis. The ride quality, for instance, is very well judged indeed. Regardless of the wheel sizes you specify, the Kia Soul flows over the road surface, filtering out most of the really obtrusive imperfections in the asphalt. It’s not perfectly judged – sharp jolts over expansion joints and deeper pot holes do upset the car somewhat – but, on the whole, we can’t find many obvious flaws with the way the Kia Soul rides. One definite benefit of those boxy proportions is that outward visibility is rather good. We’re also very impressed with the noise insulation levels. Bar a bit of tire roar at highway speeds, the cabin remains serenely quiet, thanks to the abundance of extra NVH-reducing materials that Kia has fitted to the second-gen Soul over its predecessor. Such sound suppression is made even more impressive when you consider that cars as boxy as the Kia Soul don’t tend to be rated highly in this regard (a Jeep Renegade, for example, is noticeably raucous as higher speeds). One definite benefit of those boxy proportions is that outward visibility is rather good. The larger windshield, in conjunction with the bluff body panels, makes it easy to steer the car where you want it (as well as navigating it through tight spots or city traffic, the large side windows means the cabin feels nice and airy and, bar the chunky rear pillars, the rear window is large enough for buyers who go for the base trim won’t be yearning too much for the reversing camera that’s standard fit across the rest of the Kia Soul range. This comfort-oriented approach has had an impact on the way the Kia Soul drives, however. Though the accurate steering and decent containment of body lean in the bends is admirable enough, there’s no getting around the fact the Kia Soul isn’t exactly the choice we’d recommend to people who prefer to have a bit of fun behind the wheel (a likely result of the car weighing several pounds more than its chief competitors). Those who lean to that particular end of the spectrum will be far better served by the likes of the MINI Countryman. We reckon the only one of the trio you should prioritise is the 2.0-liter four-cylinder gasoline engine. As is standard for this type of car, the Soul is offered with a variety of powertrain options to choose from: three, to be precise. However, whereas it’s possible to balance out the pros and cons, we reckon the only one of the trio you should prioritise is the 2.0-liter four-cylinder gasoline engine. We prefer this engine over the base motor in the range (a 1.6-liter four-cylinder gasoline) for quite a few reasons. It can be fitted to the more well-appointed trim levels for a start, as the 1.6-liter is limited to the entry-level Kia Soul model, and we feel the smaller of the two engines is a bit too low on power – especially for buyers who’ll be frequently driving on higher-speed section of roads. In contrast, the extra power and torque the 2.0-liter brings to the table makes it a far more flexible engine for more of the time. The fact the 2.0-liter is exclusively saddled with a six-speed automatic transmission (an option on the 1.6-liter), as it’s refined enough to the point where it doesn’t intrude on the driving experience. Gear changes are smooth, there’s little transmission whine and we were particularly impressed with the length of time the transmission held onto the appropriate gear for during heavy acceleration. Those who will be using the car on shorter journeys and will have guaranteed access to the necessary charging infrastructure may be enticed by the Kia Soul EV. Stick with the six-speed manual transmission on the 1.6-liter engine, though, and you’ll still have a pleasant ‘box with a slick and precise gear shift. Regardless of which transmission you choose, though, there is no difference in fuel consumption figures (or between the engines – both can return 24mpg in the city), we’ll let you decide if the $1,500 premium for the automatic is worth having for its extra ease of use. Those who will be using the car on shorter journeys and will have guaranteed access to the necessary charging infrastructure may be enticed by the Kia Soul EV; a version of the compact crossover that ditches a conventional engine in favour of a 108-hp all-electric powertrain. Despite the low on-paper output, the strong torque output means getting up to speed isn’t an issue, and the almost silent drivetrain makes it an even more suitable companion on highways and more open stretches of road. Or, rather, it would if the range wasn’t so much of an issue. The Kia Soul EV only has a claimed maximum range of 93 miles, which we expect to be incredibly difficult to match in real-world scenarios. Factor in the EV’s starting price of $31,000, and we’re left with the conclusion that, unless you’ll be using it as a second car, the all-electric Kia Soul isn’t a car we can instantly recommend. The Kia Soul actually comes with a decent amount of standard equipment. As with the powertrain options, Kia offers three different trim levels for the Soul: the ‘Base’, the ‘+’ and the ‘!’ (with the equivalents for the Soul EV being ‘EV-E’, ‘EV’ and ‘EV+’). And, as with the powertrains, we reckon you should leave the bookend specs be, and concentrate primarily on the middle option. That’s not to say the Base trim is inherently bad. For a car that retails from a shade under $16,000, the Kia Soul actually comes with a decent amount of standard equipment. 17inch alloy wheels, Bluetooth and USB connectivity air conditioning and power windows all come as standard, which isn’t too shabby at the price point. However, we feel the extra goodies that come with the mid-range trim are more than worth the premium, with the highlights being cruise control, keyless entry, higher grade cloth trim, a touchscreen interface and a reversing camera. Regardless of which Kia Soul model you end up buying, your car will be fitted with lots of safety gear. As nice as the ‘!’ spec is, we don’t feel it’s the best way to spend your hard earned money. It’s nearly $2,000 more expensive than the ‘+’ trim, yet doesn’t really add much new – bar the leather upholstery and power adjustable front seats, every other optional extra on the mid-range Kia Soul is still only available on the options list for the top-spec trim. Regardless of which Kia Soul model you end up buying, your car will be fitted with lots of safety gear. All models get hill start assist, stability control and front, side and curtain airbags. The Kia Soul also did well in its most recent crash test, scoring the full five stars and faring very well in the head-on and side-on impact tests, and it’s also worth pointing out that all Kia Soul models come with an amazing 10-year/100,000-mile warranty.